Gone are the days of the baby bag, as we know it. You no longer have to carry around your spare nappies, bottles and clothes in a bright yellow teddy bear bag or some quilted, gingham nightmare. Thanks to a burgeoning baby industry you can carry all your baby gear in the latest fashion bags and satchels. By choosing something neutral and trendy, not even your husband will feel any doubts about carrying the bottles and booties. Choosing a great bag will mean you can even do away with your handbag in those first few months and reduce the amount of stuff you have to worry about and carry around. Nappy bags, or baby bags come in a huge array of fabrics, styles and designs these days. You can still embrace the old school and choose something pastel or quilted or decorated with duckies and teddy bears, there are still plenty of nappy bags in that style available. But if you’re a little more style conscious or just don’t want your whole life dominated by baby themed accessories then get ready to be amazed. A good idea is to pick something your partner won’t mind carrying. A man will have no problem draping a trendy kahki satchel over his shoulder. Any chic, urban mama will feel as cool as she always has when she steps out the door with a cool canvas messenger bag in a grey, black, navy or dark green. Another important factor with the nappy bag is the strap. An over the shoulder strap, long enough that you can fish something out of it on the go is the perfect choice for a busy mum. An over the shoulder bag like a satchel or messenger bag will ensure you have both hands free at all times. Lots of pockets are handy, especially if you’re not going to carry your handbag as well as a nappy bag. Lots of pockets will ensure that your carry-all nappy bag has special compartments for mobile phones, lippy, wallet, pens as well as nappies, rash cream, wipes, bottles and toys. If you have something a little more decorative or dynamic in mind, you can choose from lovely floral prints, canvas totes, leather slouch bags and the latest fashion prints. You can opt for a discreet and petite baby wallet that will fold out for an on-the-run change mat and will contain a nappy and some wipes. And if you want the nappy bag to evolve to your needs, and would prefer the bag look like more like a hand bag than a baby bag, there are plenty of designer nappy bags that will not only accommodate babies needs but yours as well and, most importantly, look fantastic! Whether you want quilted leather, printed canvas, slouchy bohemian or something understated and black all over, you will find something to suit your needs and your budget at one of the many maternity websites or stores. 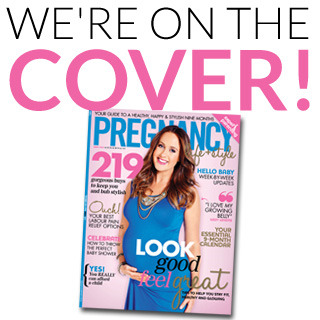 It was such a nice surprise to discover Lizzy Lovette wearing Queen Bee on the COVER of Pregnancy Life & Style Magazine!